Stellar locations and classical music executed by with world-class musicians is the hallmark of the Incontri in Terra di Siena festival. Cellist Antonio Lysy, grandson of writer Iris Origo, organized the first concert in the Val d'Orcia 30 years ago and since then the festival has become one of the backbones of Tuscany's classical music season. This summer Incontri celebrates its round birthday with an impressive line-up of musicians flying in from all over the world. Flutist Emmanuel Pahud, pianists Leif Ove Andsnes, Lucille Chung, Alessio Bax (the festival's artistic director who appears on the Oscar-winning soundtrack of 'Call Me By Your Name'), tenor Ian Bostridge, violist Lawrence Power and many more reunite in some of the most stunning venues of southern Tuscany. 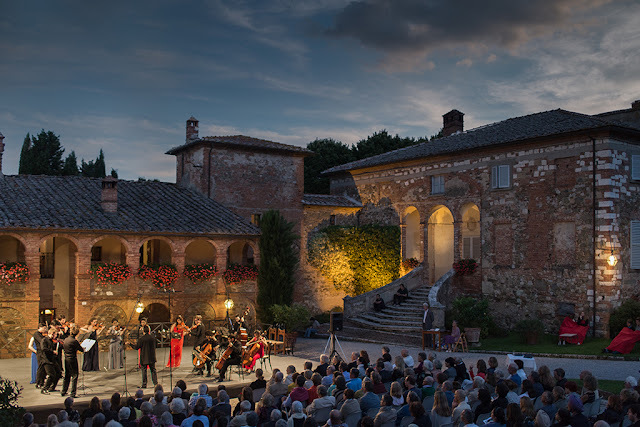 The concerts are accompanied by a dedicated program called 'Oltre La Musica' which includes guided tours through Tuscan villages, museums and theatres and book presentations. Highlight this year is the publication of Iris Origo's diary 'A Chill in the Air' which will be presented by Canadian broadcaster Eleanor Wachtel in Castiglioncello del Trinoro on August 4. Tickets 30€ (10€ for under 25). Book by emailing info@itslafoce.org. Details on program, artists and locations (Villa La Foce and many others) via website above.